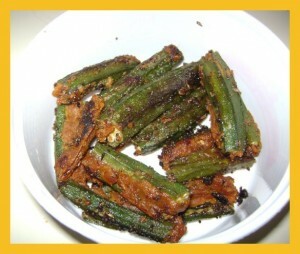 Bhari Bhindi recipe by Sam Babar at PakiRecipes.com. A very unique and delectable stuffed bhindi recipe with the ladyfinger's slit and then stuffed with spice powders and fried. Wash bhindi and dry thoroughly. Remove heads and slit one side but not all the way through so masala can be filled. Mix the rest of the ingriedients together and with a spoon fill in the bhindi . Serve with boiled rice or chapati.